Miss Tennessee Latina 2013 Leyanet Gonzalez is competing this week for the Miss Latina US title in Riviera Maya, with the finals to be held this Saturday, August 24, at the Palenque Theatre Barceló Maya Beach Resort. 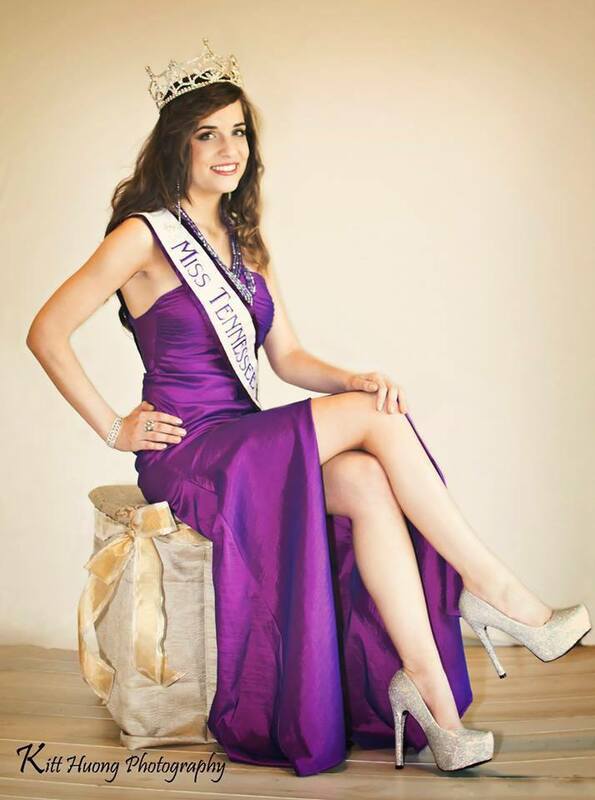 The national titleholder advances to the Miss Latin America pageant. The 2013 national pageant can be followed on the pageant site here and on the pageant's Facebook page here. Gonzalez was crowned in May at the state pageant in Clarksville. Gonzalez, 20 years old, was born in Cuba, grew up in Dalton, Georgia, and is a student at South College in Knoxville, where she is studying radiography with a concentration in nuclear medicine. "Miss" category runners-up included Yesenia Quinos of Chattanooga, Ana Maria Castaneda of Nashville, and Stephanie Amezcua of Clarksville. The category age bracket is from 19 to 27. Daniela Martinez of Franklin was crowned Miss Teen Tennessee Latina 2013 at the state pageant in May, as well. Martinez is a senior at Franklin High School (Class of 2014), is a member of the National Honors Society and the French and English Honors Society, and is a Habitat for Humanity volunteer. "Miss Teen" runners-up included Kaila Saira Jones of Clarksville, Valeria Garcia of Antioch, Angela Perez of Nashville, and Bryanna Canales of Clarksville. The teen category is for 13- to 18-year-olds. In the 2012 election edition of her high school's student newspaper, Martinez wrote a guest column, "Waiting in Line for the American Dream." Hats off to State Directors Mildred Veron & Vicky Shuler, who took over the pageant in 2011. From the pageants' Facebook presence, it appears that the title holders have been spreading the word. Veron tells HispanicNashville.com that the state pageants in Tennessee, Georgia, and Alabama teamed up to promote their titleholders as the "Queens of the South." The Georgia coordinators also run the pageants in Alabama, Louisiana, Mississippi, South Carolina, and North Carolina. Veron and Shuler are looking at organizing Kentucky, as well. She doesn’t remember it, but Leyanet Gonzalez said she came to Miami from Cuba on a small boat when she was an infant. Now a legal citizen since 2000, Gonzalez says she does her best to make her family, still in Dalton, proud. That means straight A’s, attending South College in Knoxville as a junior, pursuing medical school, and on May 18, winning the Miss Tennessee Latina pageant in Clarksville, Tenn.
She also draws strength from her brother, who struggled to speak English in school when the family came to the U.S. Today, he is in his third year of pharmacy school at Belmont University. Gonzalez said pageants allow her to feel empowered and use that strength for the betterment of young people. She entered her first beauty pageant on a whim at age 20 and was awarded runner-up. The second contest was Miss Tennessee Latina. You also have to love Knoxville.com for its story giving props to the beauty queen's parents Leonel Gonzalez and Julia Pujol. Previous winners of the state pageant can be found here. 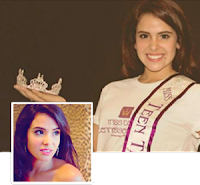 The face of the pageant from May 2012 to May 2013 was Miss Teen Latina Tennessee 2012 Karen Renee Valencia of LaVergne. Karen is an honors student at LaVergne High School and a member of the school chapter of Health Occupational Students of America. She plans to attend Vanderbilt University and study medicine, in hopes of becoming an OB/GYN. The Miss Tennessee Latina 2012 title that had been awarded to Jessica Paola Abtahi was revoked "as a result of not fulfilling her obligations, as required of a state titleholder," according to the organization. Read more about Miss Tennessee Latina 2013 Leyanet Gonzalez in profiles published by the Dalton Daily Citizen and the Knoxville News-Sentinel. ESL classes, commonly restricted to church basements, private homes, and other temporary or ill-equipped places, are now being brought to the people who need them. 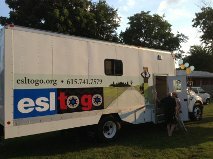 The ESL To Go truck, Tennessee’s first mobile ESL classroom, celebrated its unveiling June 22 in Nashville’s East-Centric Pavilion. The four hour event included a plethora of international food, Burmese dancing, live salsa music by Revolfusion, and speeches by Mayor Karl Dean and Gatluak Thach, Executive Director of Nashville International Center for Empowerment. The 12-seat, fully equipped, climate-controlled truck sat outside while people walked in and out. Leah Hashinger, Tenneessee Foreign Language Institute Instructor and co-creator of the project, sat inside and discussed how the idea came about. “There was a meeting held at the Tennessee Office for Refugees where they discussed the top barriers that refugees had in getting to English classes. Why aren’t they coming? They realized that they couldn’t get there,” she explains. The vehicle serves several apartment complexes with refugee resettlement communities in the south Nashville area along Nolensville road, and hopes to expand to Gallatin road by the end of the Summer. Half a dozen TESL Certified teachers work on the truck, giving two-hour lessons on Tuesdays and Thursdays to the Burmese, Iraqi, Somali, Vietnamese, and Congalese refugees in the area. On “Special Interest Fridays”, the truck is reserved for community outreach projects ranging from health screenings to workshops. Voice of America also published a profile of the ESL To Go program in Nashville, here.